One of the most sought after features on a smartphone is a good camera. It can't be understated; devices in our pockets have quickly replaced point-and-shoots because they take pictures that are good enough. But we want great, spectacular even. That day might come eventually—we want it now. Of all companies, will HTC be the one to usher in smartphone camera perfection? In a lengthy infographic posted on HTC's website, the company explores the history of photography, and also how rapidly the market is evolving. The infographic itself is pretty informative, going all the way back to 1839 when Louis-Jacques-Mande Daguerre invented the Daguerrotype. HTC also doesn't hesitate to chime in on competing companies, even implying that Nokia's PureView tech is of no significance. But HTC? Can do no wrong. The company wants us to know it has been fighting to be at the forefront of smartphone photography, and has developed some very nice software to go along with the prevalence of solid sensors. The company has more tech lined up, but it won't say what. 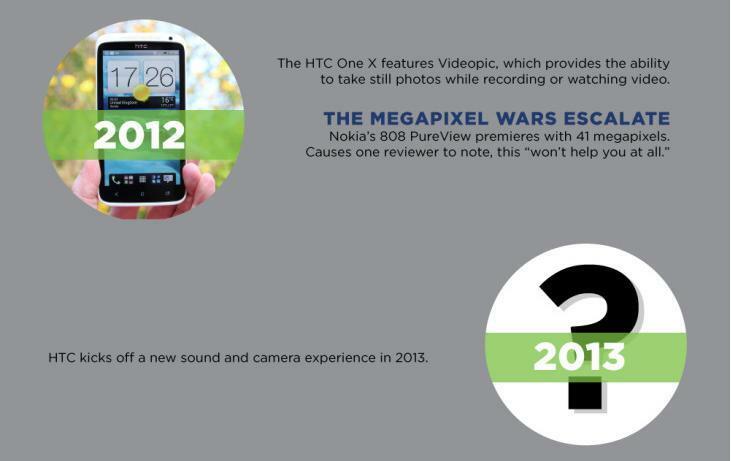 At the vert end of the infographic, the company says it has a new camera experience lined up for this year. Say what? And sound experience, too. The company doesn't elaborate, so we're left to speculate. If we'd have to guess, we'd say the M7 will be the guinea pig for such a new experience and that it will offer the best camera on an HTC device yet, along with enhanced Beats Audio. Or maybe not. But probably.